Each month, the Together 2 Goal® campaign will feature a tool or resource critical to the management of Type 2 diabetes. This month we’re highlighting the Critical Psychosocial Issues in Diabetes web-based program produced by UC San Diego Continuing Medical Education and the Behavioral Diabetes Institute. This series of video modules is designed to examine psychosocial issues in diabetes, provide a brief review of the research literature, clarify how and why the problems manifest themselves among patients with diabetes, and put forward practical solutions for the busy healthcare professional. Each module is accredited and free of charge. We are excited to share our 2019 webinar calendar with you! As in previous years, we will continue to host our hour-long monthly webinars on the third Thursday of the month at 2-3 p.m. Eastern. Be sure to join us tomorrow for our first webinar of 2019! Our featured presenter, Nisa Maruthur, M.D., M.H.S., will present on what’s new in the American Diabetes Association 2019 Standards of Care. The American Diabetes Association (ADA) Standards of Care are now available through their new phone application (app). The app includes the ADA 2018 standards for diagnosing and treating diabetes, nutrition recommendations and principles, and valuable guidelines on managing diabetes and its complications in various settings. This new app includes many interactive tools and quick access to the content. Look for updates once their 2019 standards are released. You can download the app in the App Store for iOS or Google Play for Android. Cardiovascular disease (CVD) is the number one cause of death in people with diabetes. Diabetes and Your Heart: Making the Connection is a guide to speaking with patients about Type 2 diabetes and CVD from Novo Nordisk, Inc. This brief brochure describes CVD risk for patients with diabetes and the importance of taking action. Share with patients to help them better understand how CVD may affect them and what they can do to minimize risk. Language matters in diabetes care. For people with diabetes, language has an impact on motivation, behaviors, and outcomes. Using empowering, rather than stigmatizing, language can help make diabetes management easier for patients. Mytonomy is a software and patient education company that produces videos as free resources for patient and provider education. Why Language Matters at Mytonomy is an educational video focusing on the concept of using empowering, person-first language and provides guidance on putting language guidelines into practice. Cardiovascular disease (CVD) is the leading cause of death for people with diabetes. The Boehringer Ingelheim and Lilly Diabetes Alliance – T2G’s Innovator Track Corporate Collaborator – has several resources available below to help you treat comorbid patients with Type 2 diabetes and CVD. Did you know that diabetes is the leading cause of blindness for working age adults? Many people living with diabetes don’t understand how their condition can affect their vision. The National Institutes of Health (NIH) has developed 5 Things You Should Know About Diabetic Eye Disease, a one-page handout to explain this risk. Print this out and share it with your patients today. Changing or escalating diabetes medications requires tough conversations between providers and their patients. Mayo Clinic has developed a free resource to facilitate these conversations. With the goal of shared decision-making, their tool helps providers to address A1c, lifestyle, weight, heart health, and medication cost in a patient-friendly way. Their Diabetes Medication Choice resources include an interactive online tool as well as printable cards and patient brochures. Do your patients have questions about how to eat healthy meals that aren’t boring? Encourage them to visit the American Diabetes Association’s Diabetes Food Hub for recipes. The site allows visitors to search by ingredient, type of diet (i.e., low carb, low sodium), cuisine, or meal type and offers a meal planner and grocery list tool. The Together 2 Goal® staff loves the simple Asian chicken salad recipe. Lexington Clinic in Kentucky developed this insulin training checklist for use in both staff and patient trainings. It explains the difference between bolus and basal insulin and provides step-by-step instructions for insulin injection and storage. Earn up to six continuing education credits while learning how to deliver quality care and improve outcomes for your patients with diabetes. The American Diabetes Association’s Diabetes Is Primary program will take place June 22 at the Orange County Convention Center in Orlando, in advance of its 78th Scientific Sessions. Attend this one-day meeting designed for primary care providers and learn from the experts who developed the ADA’s recent guidelines. The $100 registration fee includes admission, continuing education credits, course materials, and lunch. Register today here. Is your organization leading the pack in blood pressure control rates for your patients? Health professionals, practices, and health systems that have achieved hypertension control rates of at least 80% are eligible to enter the 2018 Million Hearts® Hypertension Control Challenge. These annual awards provide an opportunity for individuals and groups with exceptional control to be recognized with this esteemed honor. HHS and Million Hearts® have consistently recognized participants in Together 2 Goal® and Measure Up/Pressure Down® in these annual awards. The submission deadline is April 6, 2018. Don’t miss the AMGA 2018 Annual Conference – the premier gathering of leaders from medical groups and health systems, providing you with the perfect venue to exchange ideas and strategies for success with your peers. You will enjoy 37 peer-to-peer breakout sessions, including a Together 2 Goal® breakout on innovative tech and diabetes, as well as inspiring keynotes from burnout expert Abraham Verghese, disruption guru Jonah Berger, former Congresswoman Gabby Giffords, and astronaut Mark Kelly. Register by next Friday, February 16 to take advantage of the advance rate. Is your organization interested in an in-person diabetes training for your providers and staff? T2G Principal Corporate Collaborator Johnson & Johnson is offering a free, interactive, one-day training for up to three Together 2 Goal® participants in 2018. This program, called CORE, is designed to help you get to goal. Last year, three T2G participants took part and gave the program rave reviews. To be considered, please submit your application by January 31. Learn more here or reach out to us at together2goal@amga.org. Download Mercy’s one-page handout, “Top Ten Tips to Start Managing your Diabetes,” and share it with your patients. This is a great tip sheet for newly diagnosed patients, as well as those who may need a refresher for the holiday season. On Tuesday, November 14, join the American Association of Diabetes Educators (AADE) for a 90-minute webinar on the Revised National Standards for Diabetes Self-Management Education and Support (DSMES). The webinar will explain the review process undertaken by the national workgroup to create the standards and will address common misconceptions about the standards when they are integrated into practice. Attendees will hear from three presenters: Joni Beck, Pharm.D., BC-ADM, CDE, of University of Oklahoma Health Sciences Center, College of Medicine; Jodi Lavin-Tompkins, M.S.N., R.N., CDE, BC-ADM, of AADE; and Uzma Quraishi, M.S., RD, of the American Diabetes Association. The webinar costs $50 for AADE members ($65 for non-members) and provides CE credit. Thank you to everyone who joined us in Indianapolis last month for our Diabetes Symposium, held in conjunction with the American Diabetes Association. More than 100 attendees joined us for presentations, interactive breakouts, and networking. Presentations and discussions focused on three campaign planks: cardiovascular disease risk, emotional and behavioral support, and treatment algorithms. If you are interested in viewing the slides from the Symposium, please email Together2Goal@amga.org and we will send them to you. In August 2017, the American Diabetes Association (ADA) released a position statement on diabetes and hypertension, its first such statement on the topic since 2003. In it, ADA calls attention to the prevalence of hypertension among patients with diabetes and indicates that atherosclerotic cardiovascular disease (ASCVD) is both the leading cause of morbidity for people with diabetes and the largest contributor to the cost of diabetes care. ADA recommends, among other things, that providers measure blood pressure at every routine clinical care visit. The statement makes recommendations consistent with the planks in both our Measure Up/Pressure Down® and Together 2 Goal® campaigns. Per several requests following last month’s webinar, we are sharing the Behavioral Diabetes Institute’s Diabetes Distress Scale (DDS). The DDS is a 17-item scale that captures four critical dimensions of distress: emotional burden, regimen distress, interpersonal distress, and physician distress. First published in 2005, it is used around the world as a clinical instrument for opening conversations with one’s patients and as a critical outcome measures in numerous studies. This copyrighted scale is available free of charge to nonprofit institutions for use in clinical care and research. However, payment of a per-use licensing fee is required for all for-profit companies and other for-profit institutions. To find out more about licensing procedures and fees in regards to for-profit organizations, please contact the Behavioral Diabetes Institute at info@behavioraldiabetes.org. Nonprofit institutions can download a pdf of the DDS here. The American Diabetes Association (ADA), in collaboration with the American College of Physicians, Inc. and the National Diabetes Education Program, has introduced a Quality Improvement Success Stories series. Launched as a new department of ADA’s Clinical Diabetes, “Quality Improvement Success Stories” will feature articles and a searchable online collection devoted to quality improvement and practice transformation initiatives in the area of diabetes. ADA encourages healthcare professionals working in diabetes to submit the stories of their quality improvement initiatives through the journal’s online submission system. Each submission will be reviewed for inclusion in the journal’s online quality improvement repository. Selected submissions also will be published in each print issue of Clinical Diabetes. A template for success stories and detailed information for authors is available here. The diaTribe Foundation’s senior editor, Adam Brown, published a new patient resource, Bright Spots & Landmines: The Diabetes Guide I Wish Someone Had Handed Me. The book, suited for patients with Type 1, Type 2, or prediabetes, is available online for a free/name-your-own-price download. Proceeds benefit the diaTribe Foundation, which is headed by Kelly Close, a Together 2 Goal® National Advisory Committee member. In this highly actionable guide, Adam shares the food, mindset, exercise, and sleep strategies that have had the biggest positive impact on his diabetes. Bright Spots & Landmines is filled with hundreds of diabetes tips, questions, and shortcuts, including what to eat to minimize blood sugar swings; helpful strategies to feel less stressed, guilty, and burned out; and simple ways to improve exercise and sleep. Recently the Johnson & Johnson Diabetes Institute in collaboration with the National Kidney Foundation welcomed Alexis Chettiar, ACNP-BC, PhD(c) to discuss prevention, detection and treatment of diabetic kidney disease (DKD). The webinar is available on demand at www.jjdi.com. You can register and login at no charge to view the webinar. Once logged in, click on Webinars and then Complications. The Johnson & Johnson Diabetes Institute provides training for healthcare professionals in new approaches to glucose measurement, glucose management, insulin therapy and behavior change. Visit the Institute at www.jjdi.com and follow on Twitter @JJDiabetesInst to receive timely and important updates about diabetes! You can view the slides for this webinar here, and also follow these instructions on how to register to view the webinar online here. We are pleased to announce that the Together 2 Goal® discussion list has moved to a new home! Our new platform, AMGA Communities, will not only host the discussion list, but also make it easier to connect with each other, share experiences, and find information. To learn more about AMGA Communities, we’ve provided information below on who has access, what “AMGA Communities” are, where you can access the platform, and how to leverage these different capabilities. All campaign points of contact are invited to participate in AMGA Communities. To ensure peer-to-peer sharing in a closed setting, AMGA Communities are limited to AMGA members only. Corporate collaborators and nonprofit partners do not have access to the discussion list. Access a directory with the emails and phone numbers of fellow members. Link to your LinkedIn account and grow your network. Ask questions through the private listserv with a new option to respond to a person individually. Download shared files and templates or upload your own to grow the library. Search the listserv, library, and meeting archives simultaneously with the option to narrow results based on upload date, source, and more. Search for people based on multiple demographics, including group size, organization type, top issues, and more. We hope that the discussion list will continue to be a valuable tool to help AMGA members connect with fellow peers enrolled in the Together 2 Goal® campaign. Access the online webpage at http://community.amga.org with your AMGA login credentials. Discussion list emails will be sent directly to your email platform, so you don’t have to log in to see all communications. Although AMGA Communities introduces some new functionality, using the discussion list is as easy as ever! To get started, be sure to add mail@connectedcommunity.org to your safe sender list so that messages from the discussion list come straight to your inbox. To send a message, simply send an email to the following address: amga-t2g@connectedcommunity.org. Remember, while we encourage open participation by posting discussion list comments and questions directly, sensitive questions can be distributed via your regional liaison to preserve anonymity on an issue. To reply to an individual, scroll down to the end of the email and click “Reply to Sender Online” or cut and paste the email address of the individual to whom you want to respond into the “To” field. If you simply click “reply” via your e-mail application, you will be replying to the entire discussion list, rather than just the individual. Messages such as “thanks for the information” or “me, too” should be sent to individuals, rather than the entire list. To unsubscribe from the discussion list, scroll down to the end of the email and click “Unsubscribe.” Please do not send administrative messages, such as “remove me from the list,” through the discussion list. Questions? Comments? Feel free to email Leslie Ayuk-Takor at layuk-takor@amga.org. If your organization is a Goal-Getter, we want to hear from you. Whether you have motivated patients, changed a care process, or leveraged IT by implementing one of the campaign planks to improve diabetes care at your organization, tell us your story by completing the form available here. We’ve included a number of exploratory questions to help you along the way. You can also view a story from a fellow Goal-Getter, Geisinger Health System, here, about embedding point-of-care tools. A representative from the campaign will contact you regarding the draft you submitted and work with you to finalize your Goal-Getter entry, providing limited writing support as needed. Note that copy may be edited for clarity and length. If you have any questions, please contact your Regional Liaison or together2goal@amga.org. The new federal diabetes screening guideline has the potential to identify millions more people with diabetes or at risk for diabetes – but only if it is widely adopted and consistently used. Similarly, strong evidence shows the effectiveness of lifestyle interventions in delaying or preventing the onset of diabetes, but healthcare providers need to refer their patients appropriately to evidence-based diabetes prevention programs. You’ll also hear from a federally qualified health center in Texas that has improved rates of screening and referral for adults with prediabetes who are at risk for diabetes. Diabetes affects an estimated 30 million people in the United States. Diabetes screening and referral to diabetes prevention programs are proven strategies for preventing or delaying the onset of Type 2 diabetes in people at high risk for developing the disease. Reduce the annual number of new cases of diagnosed diabetes in the population. Increase prevention behaviors in persons at high risk for diabetes with prediabetes by increasing levels of physical activity, reducing the amount of fat or calories in their diets, and losing weight. The Diabetes Advocacy Alliance™ (DAA) is a coalition of 21 members, representing patient, professional, and trade associations, other nonprofit organizations, and corporations, all united in the desire to change the way diabetes is viewed and treated in America. The DAA was formed and began activities in January 2010. DAA members include Together 2 Goal® Presenting Corporate Collaborator Novo Nordisk, Inc. (DAA Co-Chairs), as well as Together 2 Goal® campaign partners American Association of Clinical Endocrinologists, American Association of Diabetes Educators, American Diabetes Association (DAA Co-Chairs), and Diabetes Hands Foundation. The first annual Together 2 Goal® National Day of Action on November 3 was a major success, empowering millions across the nation to better manage diabetes. Our National Day of Action Wrap Report, available here [PDF], highlights the many activities hosted by the campaign, including the online pledge, Twitter chat, and more. We hope you’ll join us for our second Together 2 Goal® National Day of Action on Thursday, November 9, 2017. Principal Corporate Collaborator Johnson & Johnson Healthcare Systems is offering on-site, interactive C.O.R.E. (Changing Outcomes with Resources and Engagement) training program sessions for up to three Together 2 Goal® participating organizations in 2017. This is a free campaign offering that is intended to help Together 2 Goal® participants with achieving their goals of improving care for patients with diabetes. Participating organizations must have the ability to dedicate 25-40 staff to a full, one-day, in-person training. Participants should include healthcare providers from different disciplines. Due to high demand, selection will be based on an application process. If interested, please complete the brief application form available here by Tuesday, January 31, 2017. The C.O.R.E. Program – intended for clinical and administrative leaders (e.g., CMO, CNO, department chairs, office managers, quality staff) and practicing clinicians with an interest in improving diabetes (e.g., physicians, PAs, NPs, pharmacists, RNs, CDEs, RDs) – utilizes a unique, hands-on curriculum delivered in a participant-centered learning environment. This customized opportunity will help to improve each healthcare professional’s diabetes-related knowledge and skills related to their diabetes practice, as well as work to systematically improve diabetes care to achieve the overall goals of the Together 2 Goal® campaign. This tailored program is intended for clinical and administrative leaders (e.g., CMO, CNO, department chairs, office managers, quality staff) and practicing clinicians with an interest in improving diabetes (e.g., physicians, PAs, NPs, pharmacists, RNs, CDEs, RDs). Thanks to Principal Corporate Collaborator Johnson & Johnson Healthcare Systems’ support of Together 2 Goal®, the C.O.R.E. Program will be offered at no cost for up to three AMGA members participating in the campaign. How can I see the schedule and topics of upcoming webinars? A complete schedule of upcoming webinars, including dates and times, topics, and speakers, is available on our Webinars webpage. If I am unable to attend a webinar or want to share the webinar with my colleagues, are recordings available? Within a week of each webinar, both slides and a full recording (slides & audio) are posted to our Webinars webpage. We will also send an email announcing that the recording is available to all campaign points of contact. Who can join the campaign webinars live? Campaign webinar live access is limited to participating medical groups and health systems, nonprofit partners and supporting organizations, corporate collaborators, and committee members. The recordings are available to the general public. How can I invite colleagues to join the webinars? Webinar registration emails can be forwarded to others in your organization. If you would like colleagues to receive all webinar registration emails moving forward, please email your Regional Liaison or together2goal@amga.org with their name, title, organization, and email. How can I register for campaign webinars? Registration information for campaign webinars are sent on a monthly basis via email to our campaign points of contact. To ensure you and your team members receive these communications, please add the following emails to your safe senders list: together2goal@amga.org, messenger@webex.com, and domains ending in @amgalist.org and @amga.org. We do not post the webinar registration link online because access is limited to participating medical groups and health systems, nonprofit partners and supporting organizations, corporate collaborators, and committee members. Can I register for the entire webinar series? No. Registration for campaign webinars is done separately for each webinar in order to minimize communications to those who may not be interested in or available for a specific webinar. We encourage you to register for each webinar when you receive the email with registration information. Will campaign webinars continue in 2017 and beyond? Yes! We are currently finalizing our 2017 webinar schedule and look forward to sharing the topics and speakers with you soon. Together 2 Goal® campaign webinars will continue to be held on the third Thursday of each month, 2-3 p.m. Eastern. How can I recommend topics or speakers? We welcome recommendations for campaign webinar topics or speakers. Self-nominations are also accepted. Please email your Regional Liaison or together2goal@amga.org with your recommendations. How does the Medicare Access & CHIP Reauthorization Act of 2015 (MACRA) affect diabetes care? This question was the focus of our recent Chronic Care Roundtable meeting with industry partners. AMGA Foundation President Dr. Jerry Penso recaps this meeting and shares key takeaways for your organization in his LinkedIn blog, available here. To learn more about the impact MACRA will have on your group, utilize our tools and learn from groups who have embraced risk, and start putting your strategic plan into action. We encourage you to visit AMGA’s resources available here. AMGA launched a comprehensive initiative aimed at helping members wherever they might be on the MACRA readiness spectrum―whether you're looking for a concise summary of the proposed MACRA rule, details on the two-track payment systems, or a customized workshop to set your strategy. Our MACRA and Risk Initiative will provide the insights to prepare you for action. Together 2 Goal® receives emails and calls on a daily basis from participating organizations about the campaign. From data dilemmas to plank planning, we have the answers! Sometimes, you don’t know who to reach out to, and we hope this article will help direct you. Our data team, led by AMGA Analytics, can answer questions about measurement specifications, data reporting processes, timelines, and more. To contact, please email DataHelpForT2G@amga.org. 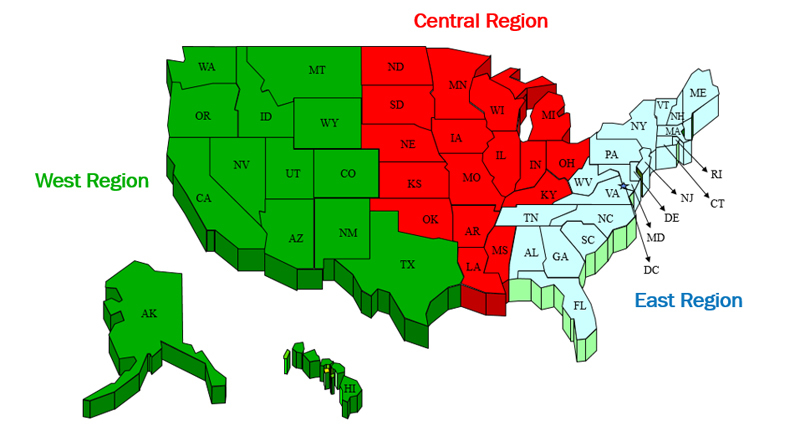 In order to better assist AMGA members participating in Together 2 Goal®, we’ve divided our campaign team into three regions, as indicated in the map below. Because many AMGA members serve multiple states, your state for this purpose is where your organization’s headquarters is located. Fear not―you can contact campaign staff at together2goal@amga.org and the appropriate point of contact will be in touch. Want to learn more about the organization behind Together 2 Goal®? Visit www.amga.org to learn about how we advance high performance health. “Where do I begin?” is often the first question patients newly diagnosed with Type 2 diabetes ask. Available in English or bilingual Spanish, this free booklet from the American Diabetes Association helps answer that question. It is also a great way to encourage them to join the FREE Living with Type 2 Diabetes program. This year-long program sends enrollees more information about living with Type 2 diabetes, new recipes to try, and opportunities to find support from others living with diabetes. Enrollment is free and easy! See an overview of what your patients will receive, and order your free booklets today! Approximately 50% of patients with chronic illnesses do not take their medications as prescribed, a serious problem that can cause delayed recovery, disease relapse, and hospitalization. In today’s fast-paced world, people often overlook taking medications at the right time every day. There are many reasons people don’t take their medications, but the most commonly cited reason is they simply forget. With Care4Today® Mobile Health Manager 2.0, consumers can set up reminders for any kind of prescription or over-the-counter medication, nutritional supplement, and refills, or customize reminders for personal goals or activities. The platform is available in multiple languages and uses secure, two-way messaging on mobile phones, and each reminder message prompts a response that is recorded in the user’s adherence report. Users can view reports summarizing adherence and share the information with their healthcare provider or caretaker. 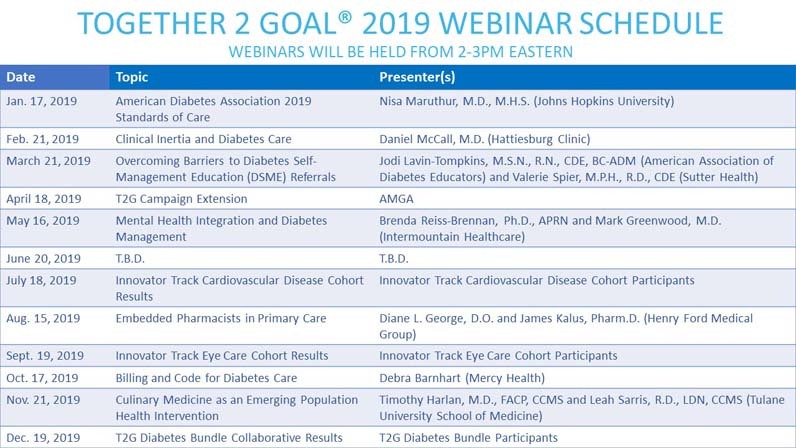 Together 2 Goal® invites you to a bonus webinar to learn more about this innovative resource from Principal Corporate Collaborator Johnson and Johnson Family of Diabetes Companies and AMGA member Sharp Community Medical Group who will share their experiences implementing the Care4Today® app. To register for the bonus webinar, please click here. 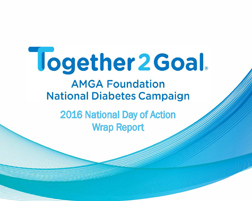 To help participating AMGA members implement best practices and address many of the common challenges associated with effectively managing Type 2 diabetes, the AMGA Foundation produced the Together 2 Goal® Campaign Toolkit. This free Toolkit (available for download here) is a living document and will be updated throughout the campaign. Build an Accountable Diabetes Team: Assemble the team and schedule the first meeting of the diabetes team. Integrate Emotional and Behavioral Support: Share the “Emotional Side of Diabetes – 10 Things You Should Know” booklet from Behavioral Diabetes Institute (enclosed in the hard copy of the Toolkit mailed to your Primary Contact) with your team and discuss as a group. Refer to Diabetes Self-Management Education and Support Programs: If you currently offer or refer to a diabetes self-management education (DSME) program, audit how many patients are currently or have participated in programs in the past year. If you do not currently offer or refer to a DSME program, identify DSME programs in your area and meet with one to explore a potential partnership. Conduct Practice-Based Screening: Run a report of patients with an HbA1c ≥ 6.5 in the past year who do not have a diagnosis of diabetes on their problem list. Adopt Treatment Algorithm: If you currently have a treatment algorithm, review the guidelines with your diabetes team. If you don’t have one, meet with the campaign’s most prominent supporter at your organization to determine the next steps in developing or adopting a treatment algorithm. Measure HbA1c Every 3-6 Months: Run a list of patients with diabetes without an HbA1c in the last 12 months. Assess and Address Risk of Cardiovascular Disease: Identify 1-2 physicians willing to integrate cardiovascular disease risk assessment using the ACC/AHA ASCVD Risk Calculator into their workflow as a pilot project. Contact Patients Not at Goal and with Therapy Change within 30 Days: Run a report of patients whose last A1c > 9 without an office visit in the past six months. Use a Patient Registry: If you currently use a patient registry, work with your vendor to determine if there are useful reports within the registry that you may not be using. If you do not currently use a patient registry, schedule a meeting with your EHR vendor to discuss registry options. Embed Point-of-Care Tools: If you currently embed point-of-care tools, conduct an inventory of the diabetes-specific tools that have been implemented. If you do not currently embed point-of-care tools, inventory the diabetes tools available in your EHR. Publish Transparent Internal Reports: If you currently publish transparent internal reports, host a small focus group to understand perceptions and effectiveness of current reports. If you do not currently publish transparent internal reports, pilot transparent internal reports at one site of care. Our first resource of the month is an important position statement from Diabetes Australia. Though it was originally published in July 2011, the thought-provoking information remains just as relevant five years later. 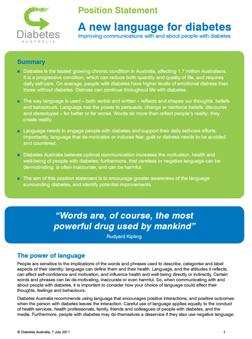 In the position statement, available here, Diabetes Australia emphasizes the power of language and how certain words and phrases can affect the thoughts, feelings, and behaviors of people with diabetes. As you build your Together 2 Goal® team, we recommend reviewing and discussing this resource together. How does your organization use language related to those with diabetes? Is it empowering? De-motivating or harmful? Reflect on how changing language can reframe the management of Type 2 diabetes for your medical group or health system. Consider terms frequently used in the healthcare setting by providers, care team members, and staff – such as diabetic, compliant, testing, or disease. Each of these word choices can have a negative connotation by people with diabetes. Diabetic, for instance, “defines the individual as their health condition. It is better to emphasize the person’s ability to live with diabetes. Labeling someone as ‘diabetic’ positions diabetes as the defining factor of their life.” This undertone is why you’ll often see Together 2 Goal® refer to “people with diabetes” instead of the alternative term. Another term to be avoided is “(non-) compliant” or “(non-) adherent.” According to Diabetes Australia, “Such terms characterize the individual as cooperative or uncooperative, especially when used as adjectives to describe the person rather than the behavior. Using these labels can mean opportunities are lost to ask relevant questions, describe collaborative goals, tailor treatment regimens, and make referrals that actively support the person to manage his or her diabetes.” While there is no single, convenient alternative term, use instead words that describe collaborative goal-setting. A New Language for Diabetes has over 10 other examples of language to be avoided, rationale, and examples of preferred language. Acknowledge the frustrations, anxieties, guilt, and distress that many people with diabetes experience. Be aware of the language you use. Appreciate that the meaning and acceptability of words and phrases changes over time. For more information about each of these recommendations, as well as to learn more about improving communications with and about people with diabetes, please read the comprehensive document here.